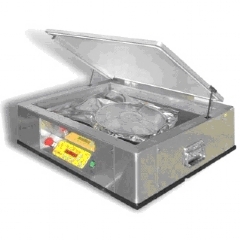 Clean room compatible machine, stainless steel chamber, designed to package trays, tubes, tape and reels. The use of a compressed air-driven vacuum pump minimizes noise, vibration and heat generation. Very accurate adjustment of vacuum which is controlled by an internal sensor.